Practice And Planning Needed To Evacuate Elderly In A Storm : Shots - Health News After three hurricanes, a big snow storm and an ice storm, residents and staff of a retirement community in Charleston are starting to view evacuations as the reality of growing old on the coast. 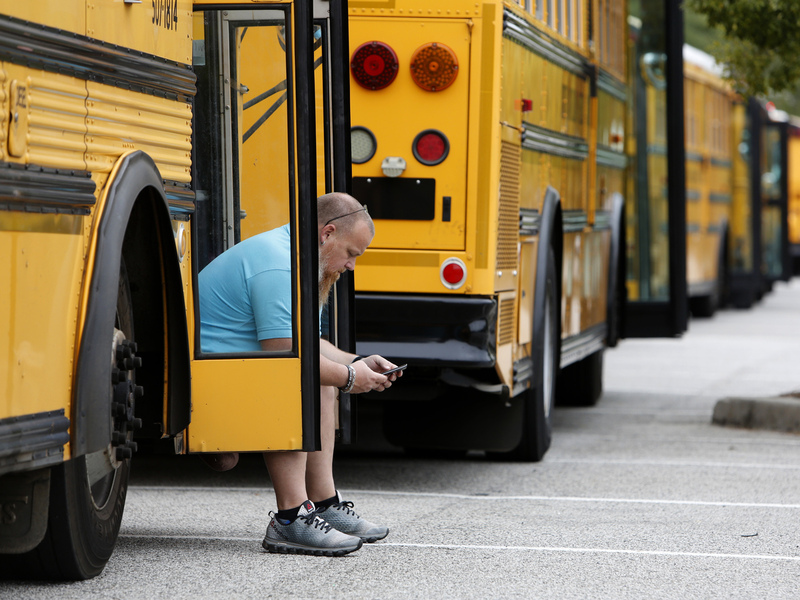 Jay McAbee, a bus driver with the Greenville, S.C., school district, waits by his bus in Charleston, S.C., in October of 2016, for word of when to start evacuating the city's residents in advance of Hurricane Matthew. Simply having enough buses to carry pets as well as people can be key to convincing residents they need to leave ahead of a big storm, emergency responders say. The benefits of retiring in South Carolina's low country are clear to Joyce East. Her home, sandwiched between the Atlantic Ocean and downtown Charleston, overlooks 120 acres of lush marshland. Palm trees and Spanish moss dot the property. But the drawbacks of retiring only a few meters above sea level have also become apparent to the 91-one-year-old retiree. 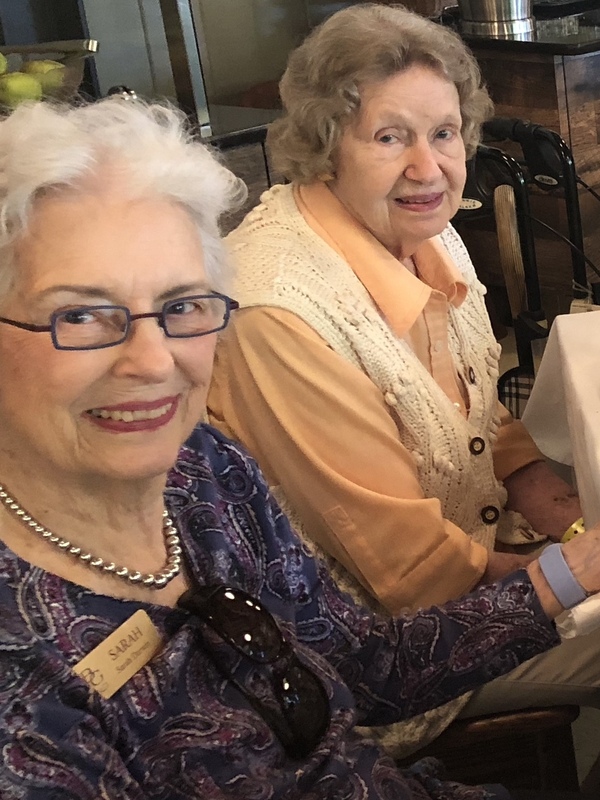 Since 2016, her home within Charleston's Bishop Gadsden Retirement Community has weathered one snow storm, one ice storm and three hurricanes. She has had to evacuate twice in two years. For East, these evacuations are just the cost of growing old on the coast. Three decades ago, East and her husband decided they wanted to retire somewhere warm on the waterfront. Four days after arriving in Charleston, the couple was forced to flee inland as Hurricane Hugo ravaged the coast. East would evacuate again for Hurricane Matthew in 2016, and once more for Hurricane Florence this past September. Joyce East (right) with fellow Bishop Gadsden resident Sarah Darwin during their evacuation from their community on the South Carolina coast in September 2018. "Now that we've done it this much, it's more of a routine," says East. She packs her belongings in a navy evacuation suitcase with her name printed on it in white lettering. "I have to kind of look at it as a mini-vacation now." As unpredictable weather starts to feel inevitable, staff at Bishop Gadsden have worked to make evacuations feel as routine to residents as Monday night's pub trivia. This year's personalized suitcases were a new touch. "Our planning is 24/7, 12 months a year," says Kimberly Borts, one of the staff members charged with ensuring Bishop Gadsden is ready to depart come hurricane season. "This isn't just let's get on a bus and go." When Governor Henry McMaster mandated residents evacuate in the lead up to Hurricane Florence, he set in motion a sequence of events staff had spent the year fine-tuning. Ambulances arrived at 2 a.m. to whisk away the 14 seniors too frail to make the journey upright. The remaining 111 residents boarded buses bound for a mountaintop inn. A U-Haul was loaded up with walkers and a bus carted off residents' pets. It's high stakes logistics. Any hiccup — too few oxygen tanks, lost medication — would have been disastrous. But even a well-executed journey carries risks for Bishop Gadsden's retirees, many of whom are accustomed to a regimented routine. "When that schedule is altered, that's when you begin to have some challenges," says Borts. During this year's departure, she saw anxious residents who traditionally require one oxygen tank per day go through two tanks or more. As the seniors made their journey inland, Borts noted more upset stomachs and more bathroom trips. Immediately after they returned from the shelter, Borts says staff began plotting how to make the journey smoother for their seniors — next year. "We would sort of say to our fellow staff members, 'Well, next time we do this,' or 'Next year we need to do X,Y, Z,' " she recalls. Statistics show there will be a next time. Far beyond the marshy coast of Charleston, emergency evacuations are starting to seem commonplace. Susan Burns monitors evacuations for Sedgwick, a company that deals with insurance claims for senior-living communities across the U.S.
After nursing home owners made the fatal decision not to evacuate residents in advance of Hurricane Katrina, Sedgwick began offering to reimburse facilities for part of their evacuation costs. But, until recently, no facility had taken the company up on the offer. "I had not seen this coverage triggered at all until last year," says Burns. She traces the uptick in recent claims to the "amazing number of natural disasters back to back" that have ravaged states like Florida, California and Missouri. "They're just trying to recover some of the costs and lessen the financial blow," she says. This year, Bishop Gadsden spent $350,000 on shelter and transportation. The facility had shelled out a similar amount in 2016 for Hurricane Matthew. And they're prepared to do it again. "You take care of a residents during good times and bad times," says Borts. "The most important thing we can do is plan to do this again." This story is part of NPR's reporting partnership with Kaiser Health News, an editorially independent news service of the Kaiser Family Foundation. Rebecca Ellis is a Kroc Fellow at NPR.